During the 2012 debates, political scientists Amber Boydstun, Timothy Jurka, Matthew Pietryka (University of California, Davis) and Rebecca Glazier (University of Arkansas at Little Rock) worked with computer scientist Philip Resnik to run React Labs: Educate, an educational package for use by instructors during one or more of the presidential or vice-presidential debates in October. 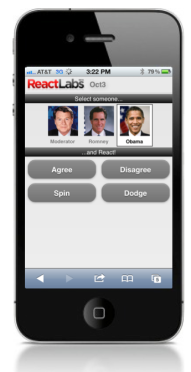 React Labs: Educate runs on smartphones and allows participants to register their in-the-moment reactions to what candidates are saying during a debate, using button taps (e.g. Agree and Disagree), and answering pre- and post-debate survey questions (e.g. partisanship, issue priorities, demographics), as well as questions throughout the event (e.g. “Which candidate do you prefer at the moment?”). Instructors sign up. Instructors register their course(s) for real-time polling. Instructors receive educational materials. Instructors are sent pre-debate educational materials, including a list of key research articles, classroom discussion points, and a collection of Microsoft Powerpoint slides suitable for use in a lecture or class discussion about debate rhetoric. Instructors also receive a Group ID for each course registered. Instructors receive a Group ID and instructions for accessing the app to pass along to their students. Students open app 5-10 minutes before debate. Students open the app and complete a brief pre-debate survey. Students watch and react. Students use the React Labs app during the debate. Instructors can also have access to a live-charting Web site showing the pooled reactions of everyone participating in React Labs: Educate, which they can choose to display/project to participants. Students complete brief post-debate survey. Students MUST complete a brief (5 minute) post-debate survey, at the conclusion of which students will be asked to input their Group ID and name. Students’ names are used only to provide instructors with a list of which of their students participated. Names are never be linked to the response data and are deleted as soon as instructors have been sent their lists. Instructors receive collected data. The day after the debate, instructors receive a post-debate educational package including PowerPoint slides containing graphs summarizing the reactions of all React Labs: Educate participants, plus additional classroom talking points. Give students credit. Instructors receive a summary of which students in each course participated in case instructors want to offer assignment credit (or extra credit). Instructors are encouraged to consider offering some kind of credit in order to increase student participation.